Coach's decision to slash handbag prices has paid off. The brand has posted a 37% profit increase for the first quarter of the year. Some might have seen Coach's strategy to cut handbag prices by 12% and price more purses under the $300 mark as a risky one. However, it seems the bargain bags helped to lure shoppers into Coach boutiques. In fact, handbag sales account for 59% of Coach's American first-quarter sales, up from 54% in the same period last year. Analysts say these results are a sign that affluent shoppers are in the mood to spend following the global recession. 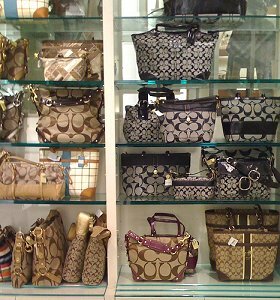 While shoppers have enjoyed more affordable prices from Coach in the recent past, they may not last for much longer. Mike Tucci, the president of Coach's North American retail division, hinted that prices could rise as the brand develops its product line. He says Coach is "really targeting that core ... sweet spot" between $298 and $358. It's not exactly exorbitant, but not bargain basement either. Only time will tell whether this shift will benefit Coach, or whether customers will turn their nose up at the higher prices.